Weather in our area is predictably unpredictable…winters can be mild or they can be severe. The wide swings in temperature and water conditions can wreak havoc on our lawns and landscape plants. With El Nino bearing down on us this winter, there is high probability of severe storms, snow and ice. The healthier your lawn is before winter hits, the better it will stand up to some seasonal abuse. While there is no guarantee that trees, shrubs and other landscape plants won’t suffer at least some damage during severe weather, there are a few things you can do to help minimize the impact of cold temperatures, ice and dry spells. Whether you do it yourself, or have a service do it for you, feeding the soil will help your lawn hold up to extreme weather. While now is not the time to be adding intense nitrogen fertilizers to your lawn, it is the time to feed the soil. Because our soils don’t freeze, and plant roots continue to grow, organic biostimulants such as liquid compost extract can help keep robust during winter months. We also use liquid compost extract during the cool season as foliar feed on your lawn to help winterize it. Your lawn is probably not dormant yet, so you’re still mowing. Resist the urge to mow your lawn too short or “scalp” it, as that will leave it susceptible to cold damage. St. Augustine grass is particularly susceptible to frost damage, especially when it’s already been stressed from drought, overwatering or disease. Do mow to control the weeds: You want to make sure you keep the weeds mowed so they don’t flower and go to seed. Often your mower doesn’t need to be set very low to deadhead the weeds. This will help you prevent an overgrowth of early spring weeds. Soil temperature and moisture plays a big part in plant health. Mulch can help insulate plant roots, maintain more consistent moisture, and add organic matter over time. Add a 2-3” layer of natural mulch in landscape beds and around the root zone of trees (never pile mulch up against plant and tree trunks). Hate spring weeds? Mulch will also help suppress growth of cool season weeds which can get out of control in early spring. A freeze is coming…what do you do? 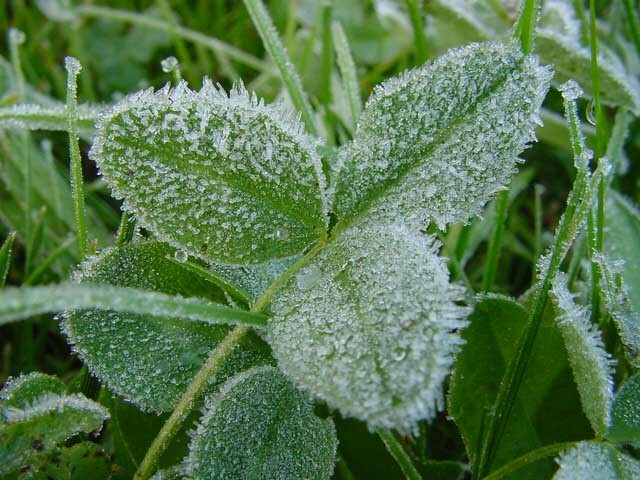 If allowed within your water restrictions, water your lawn and landscape plants 24-hours before a hard freeze. Moist soil can help keep plant roots better protected than dry soil. Roots that have absorbed more water are also better able to withstand freeze damage. Wrap tender shrubs and perennials in frost cloth or a sheet. This will keep plants 4 to 6 degrees warmer than air temperature on average. Never cover plants in plastic as they can suffer burn. When the days warm back up above freezing, remember to uncover plants so they receive necessary sunlight. Because our soils typically don’t freeze (or when they do, they thaw quickly), lawns and landscape plants will continue to take up water through winter. Dry conditions when it’s cold can cause a lot of plant damage. So while you don’t want to overwater in winter, you will still need to water from time to time to keep plants healthy. Lawns typically need a good deep watering about once per month during winter – perhaps a bit more often if we’re not getting any rainfall. You can learn more about how to water your lawn in winter HERE.